Two lighting-fast goals just fifty-one seconds apart at the start of the third period overturned the deficit and vaulted inexperienced Switzlerand to a 2-1 triumph over Slovakia and a respectable second place finish at the 2014 Deutschland Cup international tournament in Munich. 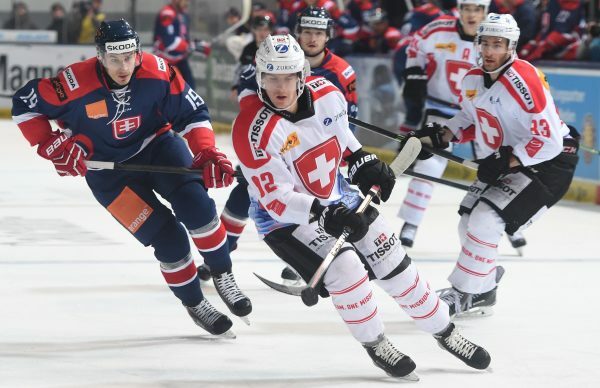 After two consecutive games against the much heavier-hitting Canadian and German squads, the Slovaks enjoyed a far less physical contest against the youthful Swiss and probably had the better of play in the first two periods, as well. With less than four and a half minutes left in the second period, Slovakia stormed to the lead when HC Kosice right wing Adam Lapsansky converted a fabulous chance coming from between the two faceoff circles after a centering pass from behind the net. For Lapsanky, who has never appeared at a major international tournament as of yet, it marked the third consecutive game at this 2014 Deutschland Cup that the 24-year-old Slovak scored one goal. 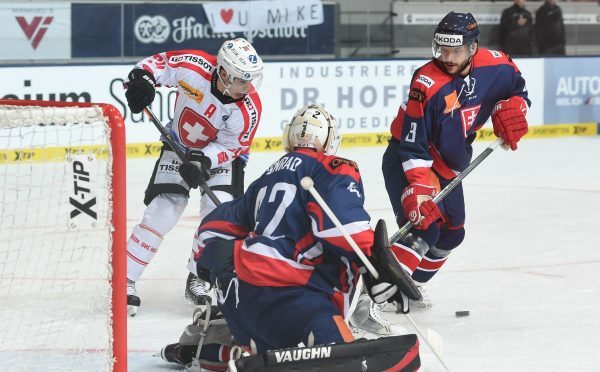 Switzerland, however, were fortified by the goaltending of Sandro Zurkirchen of HC Ambri Piotta, the 24-year-old who was making just his second-ever appearance for the national team; Zurkirchen, to review, had made 36 saves for the Swiss in the 2-1 win over Canada the day before and was a major reason why Slovakia failed on five power play opportunities on the last day of the tournament in Munich. Switzerland fought back to tie the score barely more than four minutes into the final frame when EV Zug right wing Lino Martschini, the 21-year-old who spent two seasons playing major junior in Canada for the Peterborough Petes of the Ontario Hockey League, went on a solo skate through the Slovakia defense. Less than sixty seconds thereafter, the Swiss struck for a winner when the trio from Nationalliga A side HC Davos finished with aplomb. Samuel Walser, the 22-year-old center who had also scored Switzerland’s first goal in the 2-1 victory over Canada at this 2014 Deutschland Cup, netted yet again after taking a drop pass from Dino Wieser, the 25-year-old left wing who had defeated the Canadians by scoring into an empty net just the day before. Highly experienced trainer Glen Hanlon, the long-time National Hockey League goaltender and former Washington Capitals head coach who is now in his first season in charge of Switzlerand’s national team, was pleased and encouraged by both the effort and progress his players demonstrated throughout the weekend tournament in Munich. Slovakia defenseman Tomas Bokros (3), the 25-year-old who spent last season with SK Sodertalje in the Swedish second division, and speedy Switzerland left wing Reto Suri of EV Zug, the 25-year-old Olympic veteran who has already appeared at three major international tournaments (20 ga, 6 go, 11 pts) in his career, search for the loose puck in front of the net on the final day of the 2014 Deutschland Cup competition. A lightning-quick goal roughly one and a half minutes into the game and a second strike with forty seconds remaining to be played in the second period would prove to be all the offense that was required as host nation Germany ultimately held off late charging Slovakia 2-1 on the second day of the 2014 Deutschland Cup international tournament in Munich. The Germans made a dream start when ERC Ingolstadt left wing Patrick Hager, the 26-year-old who has appeared at the annual IIHF World Championships three times (19 ga, 1 go, 2 pts) in his career, was the first to jump on a loose puck in front of the net after Slovakia goaltender Marek Ciliak, the 24-year-old from Czech elite league outfit HC Brno, left an inviting rebound. 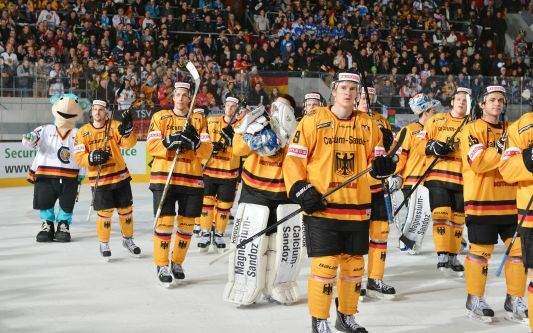 Hager beat Ciliak, who was making his senior international debut for Slovakia, low to the stick side to give Germany the 1-0 lead at the 1:39 mark of the opening period. 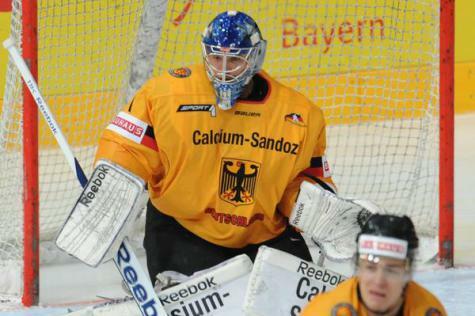 Patrick Reimer, the 31-year-old Nuremberg Ice Tigers right wing recall to the national team for the first time in nineteen months, provided die Vorarbeit. Slovakia almost struck back right away in the third minute through Marek Viedensky, the 24-year-old right wing from Finnish elite league club HPK Hameenlinna who was the seventh round selection (# 189 overall) of the San Jose Sharks at the 2009 National Hockey League Draft before spending three seasons (120 ga, 15 go, 40 pts) skating with the Worcester Sharks in the American Hockey League. The Slovaks had no luck, though, as the shot from Viedensky, who scored three goals in seven games for Slovakia at the 2014 IIHF World Championships last spring, could only strike iron. Just two minutes later, though, Germany defenseman Justin Krueger from Swiss Nationlliga A side SC Bern, the 28-year-old out of Cornell University who was the seventh round choice (# 213 overall) of the Carolina Hurricanes at the 2006 NHL Draft and skated two seasons in the AHL for the Charlotte Checkers, was also denied by the goal cage. When not being bailed out by his goal posts, Timo Pielmeier of ERC Ingolstadt, the 25-year-old netminder who was selected in third round (# 83 overall) of the 2007 NHL Draft by the San Jose Sharks but only ever did make one disastrous appearance (7.50 avg, .583 svpct) for the Anaheim Ducks at North American hockey’s highest professional level, was busy giving a good account of himself between the German pipes. Very late in the second period, the Slovaks were able to get another puck past Pielmeier, who was making just his third-ever appearance for the national team, but were again thwarted by metal. This time it was Slovakia right wing Roman Rac, the 23-year-old from Czech Extraligia side HC Olomouc, who went without good fortune. The second Pfostenschuss from Slovakia would prove to be extremely pivotal, then. With exactly 40 seconds left to be played in the second period, Germany notched a second goal when veteran center Christoph Ullmann of Adler Mannheim sent a very hopeful puck in on net from the boards on the extreme right wing. Thanks to an inadvertent deflection from Slovakia defenseman Radek Deyl, the 25-year-old from Czech club HC Karlovy Vary, the little black disc ended up behind Ciliak to give the 31-year-old Ullmann his 20th career goal on his 146th appearance for the national team of Germany. Reimer, the rejuvenated right wing who scored two goals during Germany’s 3-1 win over Alpine arch-rival Switzerland on the first day of this 2014 Deutschland Cup competition, drew his second assist of the game against Slovakia on Ullmann’s strike. 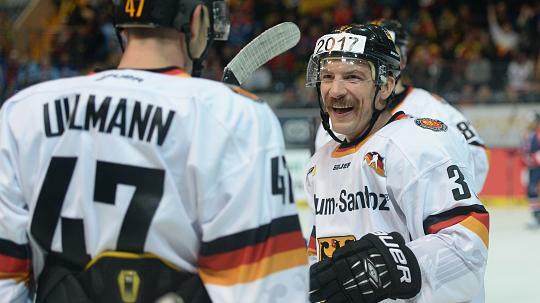 Almost eight minutes into the third period, the speedy veteran who totaled 33 goals and 65 points in 50 Deutsche Eishockey Liga games for Nuremberg last season almost gave Germany was would have been a 3-0 lead over the Slovaks. But Reimer’s rising backhander only rang the crossbar. With a little less than four and a half minutes remaining in regulation, the Slovaks hauled themselves back into serious contention when a long shot from out on the left wing by Adam Lapsansky, the 24-year-old from domestic side HC Kosice who also scored a goal during Slovakia’s 4-1 triumph over Canada in the opening game of the 2014 Deutschland Cup, found its way past the somewhat screened Germany custodian Pielmeier. Seeking to capitalize on its own momentum, Slovakia ratcheted up the pressure and forced Pielmeier, who spent most of his three seasons of North American pro hockey playing in the third-tier East Coast Hockey League before signing with German second division club EV Landshut in the summer of 2012, into making a few more good saves. The Slovaks’ attack petered out towards the end, however and veteran trainer Vladmir Vujtek‘s side never really were able to pull Ciliak in favor of a sixth attacker. “The German goaltender was very strong and the reason why we only scored one goal today,” offered Vujtek to the media after the game in Munich. Germany goaltender Timo Pielmeier, who made 37 appearances (3.09 avg, .906 svpct) for the Syracuse Crunch during the 2010/11 American Hockey League season but spent the bulk of the following campaign with the Elmira Jackals of the East Coast Hockey League, makes a save against Slovakia during the 2014 Deutschland Cup in Munich. Solid netminding throughout the contest and a back-breaking shorthanded goal scored early in the third period helped power Slovakia to a convincing 4-1 triumph over Canada on the opening day of the 2014 Deutschland Cup international tournament at the Olympia-Eisstadion in Munich, Germany. Defenseman Juraj Mikus of Czech club Sparta Prague, the 25-year-old who skated in the American Hockey League with the Toronto Marlies for three seasons after being selected in the fifth round selection (# 134 overall) of the 2007 National Hockey Draft League, scored a power play goal in the latter stages of the opening period to give Slovakia the lead. Rearguard Radek Deyl, the 25-year-old from Czech side HC Karlovy Vary who was a late addition to the roster for the Deutschland Cup, then doubled the Slovaks advantage late in the second period. 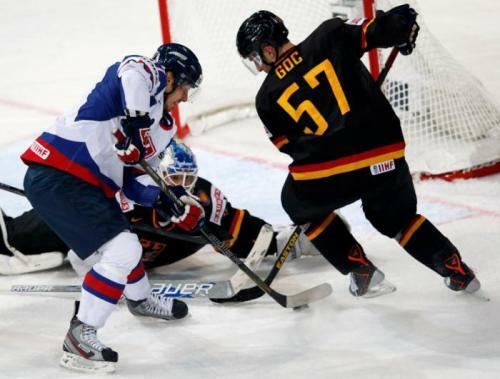 Left wing Vladimir Dravecky of Czech outfit HC Trinec, the 29-year-old veteran who skated a season and a half in the AHL for the Manchester Monarchs and represented Slovakia at the 2010 IIHF World Championships in Germany, set up the first two goals of the game. The Canadians looked to have hauled themselves back into contention when former Eisbaeren Berlin defenseman Micki DuPont, the 34-year-old veteran from Swiss side EHC Kloten who once skated a combined 23 NHL games for the Calgary Flames, Pittsburgh Penguins and St. Louis Blues, netted a 5-on-3 power play goal less than a minute and a half into the third period. Canada captain Steven Reinprecht of Nuremberg Ice Tigers, the 38-year-old former University of Wisconsin Badgers skipper who made 596 appearances (121 go, 336 pts) in the NHL for and won a Stanley Cup with the Colorado Avalanche back in 2001, assisted on the strike. But then the Canucks, considered by many to be the tournament favorites coming into the 2014 Deutschland Cup and still skating with the man advantage, conceded a critical goal just 28 seconds later and never really recovered. Right wing Adam Lapsansky of HC Kosice, the inexperienced 24-year-old who has never appeared at a major international tournament in his brief career, finished off a shorthanded two-on-one break with center Patrik Lusnak, the 25-year-old who skates professionally for HC Yunost Minsk in Belarus, to give Slovakia a 3-1 lead. With a little less than eight minutes remaining in the contest, 23-year-old right wing Roman Rac of Czech side HC Olomouc closed the door on Canada for good by scoring a goal on his international debut for Slovakia. Canada skipper Steven Reinprecht (# 28), the highly experienced veteran who received a gold medal at the 2003 IIHF World Championships after notching six assists in eight games, and Slovakia captain Ivan Svarny, the 30-year-old defenseman from Kontinental Hockey League club Dynamo Minsk in Belarus who has appeared at the annual IIHF World Championships three times in his career, come together in front of net during the opening round match of the 2014 Deutschland Cup international tournament being held in the southern German state of Bavaria. After earning a silver medal at the 2012 IIHF World Championships in Scandinavia, the national team of Slovakia has fallen on hard times at major international events in the past two seasons and imported Czech trainer Vladimir Vujtek, the veteran head coach whose son of the same name appeared in 110 National Hockey League games for several clubs during his playing career, will be using the 2014 Deutschland Cup to be held at the Olympia-Eisstadion in Munich largely as an opportunity to evaluate the country’s younger players in preparation for future tournaments. Vujtek has selected seven players (including a reserve goalkeeper) who were on Slovakia’s roster at the 2014 IIHF World Championships last spring. And two others listed on the preliminary 24-man roster for the 2014 Deutschland Cup have also appeared for at a major international tournament earlier in their careers. For the most part, however, this Slovakian squad is relatively young and inexperienced. An overwhelming majority of Slovakia’s team are actually foreign-based professionals, eighteen in all with fourteen of these legionnaires plying their trade in the neighboring Czech Republic. The starting goaltender figures to be Julius Hudacek of Swedish elite league side IK Orebro, the 26-year-old who has been on the Slovakia’s roster at annual IIHF World Championships for the past three years in a row but did not play in any games. Hudacek has made nine appearances for the senior national team of Slovakia in his career, though. The other goaltender on Vujetk’s list for the 2014 Deutschland Cup, 27-year-old Branislav Konrad of Dukla Trencin, was a reserve for Slovakia at the 2007 IIHF World Championships but did not make any appearances at that tournament. Ivan Sarny, the 30-year-old veteran who now skates professionally in Belarus for Kontinental Hockey League side Dynamo Minsk, will be Slovakia’s most experienced defenseman at the 2014 Deutschland Cup; Sarny has made a total of 79 appearances for the senior national team and has played at three IIHF World Championships (2009, 2013 & 2014) previously. Defenseman Marek Daloga of Czech club Sparta Prague is the 25-year-old who has skated with Slovakia at both the 2013 & 2014 IIHF World Championships while rearguards Juraj Valach of Czech side Slavia Prague and Peter Ceresnak of Czech outfit HC Vitkovice, the 21-year-old who was the sixth round pick (# 172 overall) of the New York Rangers at the 2011 NHL Draft, were also participants at the IIHF’s annual event last spring. Defenseman Juraj Mikus of Czech club Sparta Prague was the fifth round choice (# 134 overall) of the Toronto Maple Leafs at the 2007 NHL Draft and skated three seasons in the American Hockey League for the Toronto Marlies (200 ga, 12 go, 51 pts) and 21-year-old blueliner Adam Janosik of domestic side HC Kosice was the third round selection (# 72 overall) of the Tampa Bay Lightning at the 2010 NHL Draft. The most promising forward appears to be Marek Viedensky from Finnish elite league club HPK Hameenlinna. The 24-year-old center was taken in the seventh round (# 189 overall) of the 2009 NHL Draft by the San Jose Sharks and spent the past three seasons skating in the AHL for the Worcester Sharks (120 ga, 15 go, 40 pts). Viedensky fled North American pro hockey this past summer after scoring three goals in seven games for Slovakia at 2014 IIHF World Championships last spring. Another former North American pro is Vladimir Dravecky of Czech side HC Trinec, the 29-year-old right wing who went pointless in six games for Slovakia at the 2010 IIHF World Championships after having skated a season and a half in the AHL for the Manchester Monarchs (111 ga, 9 go, 36 pts) previously. The only Olympic veteran currently listed on Slovakia’s for the 2014 Deutschland Cup tournament is Tomas Marcinko, the 26-year-old from Czech outfit HC Pardubice who made one appearance at the XXII Winter Games hosted by Sochi, Russia, before going pointless in six games at the 2014 IIHF World Championships. Slovakia goal-scoring hero TOMAS ZABORSKY of Russian Kontinental Hockey League club Avangard Omsk originally began his professional career in the New York Rangers organization after being selected in the fifth round of the 2006 National Hockey League Draft but spent the majority of his rookie season in the East Coast Hockey League after failing to earn a regular place with the Hartford Wolf Pack, the Rangers’ top affiliate in the American Hockey League. Zaborsky established himself as a legitimate threat in his second term with Finnish elite league side Assat Pori and has continued that goal-scoring trend despite a lucrative move to Russian club Avangard Omsk of the multi-national Kontinental Hockey League at the start of this past season. Slovakia left wing VLADIMIR ZABORSKY (67) of Russian KHL club Avangard Omsk hammers Russia center SERGEI MOZYAKIN of Metallurg Magnitogorsk, the 32-year-old veteran who led the Kontinental Hockey League in scoring this season for the third time in his career, along the boards during the 2013 IIHF World Championships – Group Helsinki contest at the Hartwall Arena in Helsinki, Finland. Slovakia defenseman VLADIMIR MIHALIK (56) of HC Slovan Bratislava, the first round selection (# 30 overall) of the Tampa Bay Lightning at the 2005 National Hockey League Draft who only ever skated 15 NHL games over the course of four seasons of professional hockey in North America before returning to Europe, and veteran Germany left wing MICHAEL WOLF of Islerlohn Roosters battle for position in front of the net during the 2013 IIHF World Championships – Group H contest at the Hartwall Arena in Helsinki, Finland. A pair of third period goals from a debutant player once considered not even good enough by the New York Rangers to sustain a regular place with the American Hockey League affiliate rallied defending silver medalist SLOVAKIA to a come-from-behind 3-2 victory over hard-luck GERMANY in Group H play at this year’s IIHF World Championships. The result was a most frustrating loss for the Germans, who came into the Helsinki clash having beaten Slovakia in eight out of twelve all-time contests at major international tournaments including the last three meetings on the trot. Trainer PAT CORTINA’s side did do yeoman’s work at both ends of the ice for long stretches of time, however, two of the goals conceded by Germany were given away rather cheaply. Still, on the whole, the Germans were a bit unlucky to not get at least something from the game and now find themselves having earned just one of nine possible points in the Group H standings. In the wake of Germany’s failure to qualify for the men’s ice hockey tournament at the XXII Winter Olympic Games to be held in Russia next winter, both Cortina and current Deutsche Eishockey Bund president UWE HARNOS remain under a white-hot spotlight at this year’s annual IIHF affair. Some German supporters who found their way to Finland feel that the root cause of the national ice hockey team’s problems may not entirely rest with the trainer. Just outside Germany’s VIP box at the Hartwall Arena in Helsinki was prominently hung a large banner that read, “harNOs WAY”. Germany winger MICHAEL WOLF (16) of Iserlohn Roosters had already scored 42 goals on 123 appearances in all international matches for Deutschland in his career prior to the start of this year’s IIHF World Championships. The Germans got off to an uncharacteristically fast start against Slovakia at the Hartwall Arena and found themselves ahead with only a little over four minutes having expired off the game clock. Adler Mannheim defenseman NIKOLAI GOC floated a rising shot from the left point that veteran Iserlohn Roosters winger MICHAEL WOLF skillfully deflected down and through the legs of Slovakia netminder RASTISLAV STANA from Russian Kontinental Hockey League club CSKA Moscow. 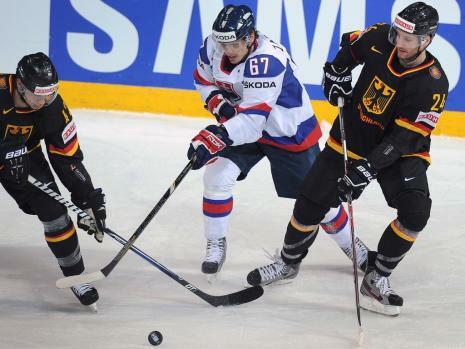 The diminutive but experienced Wolf was able to score his 10th career goal for Germany at major international tournaments despite being cross-checked in the back by Slovakia defenseman MAREK DALOGA of Czech Extraliga club HC Pardubice. TOMAS SUROVY of HC Lev Pravda, a Prague-based representative from the Czech Republic in the Russian-dominated Kontinental Hockey League, had an excellent chance to haul Slovakia level a little over six minutes into second period after receiving a smart cross-ice pass but the 31-year-old right wing who once skated 126 National Hockey League games (27 go, 59 pts) over the course of four years in the Pittsburgh Penguins organization, had his shot slam off the near post with the German netminder already beaten. The Slovakians were actually held off the scoreboard by the Germans for more than half the contest in Helsinki before defenseman MICHAEL SERSEN of HC Slovan Bratislava, the fifth round (# 130 overall) pick of the Pittsburgh Penguins at the 2004 NHL Draft who is appearing at the annual IIF World Championships for a third year in succession, launched a long, routine shot from the right point that Germany goaltender ROB ZEPP of Deutsche Eishockey Liga champion Eisbaeren Berlin saved but did not control. On hand in the slot to snap up the inviting rebound for Slovakia was a hustling MARIO BLIZNAK of HC Slovan Bratislava, the 26-year-old center who skated six NHL games (1 go, 0 as) over parts of two seasons for the Vancouver Canucks before signing with HC Sparta Prague in the Czech Republic Extraliga at the start of the 2011/12 campaign. Germany regained the lead just three minutes into the third and final period after Adler Mannheim center MARCUS KINK took a pass from veteran right wing JOHN TRIPP of Kolener Haie in the neutral ice and sped into the Slovakia defensive zone; faced with a one-on-one situation opposite NHL defenseman ANDREJ SEKERA of the Buffalo Sabres, the 28-year-old forward who serves as captain of his club team in the Deutsche Eishockey Liga, went to the backhand and produced a surprising shot that the Slovak netminder Stana got a piece of but could not keep out. The seasoned 33-year-old who once made six appearances (3.13 avg, .890 save pct) in the vaunted National Hockey League for the Washington Capitals during the 2003/04 campaign, would not be beaten again, however, and went on to finish with 30 saves in the Group H match against Germany. Stana, a two-time Olympian who has now been on the roster of Slovakia at twelve major international tournaments in his career, was recalled for the first time since the 2010 IIHF World Champinships held in Germany and had only played 14 games (2.75 avg) in his career at major international events heading into this year’s annual IIHF affair in Scandinavia. Germany’s advantage did not last for long as Slovakia promptly went on the counterattack. Pinching in from the left point, defenseman VLADIMIR MIHALIK of HC Slovan Bratislava carried along the boards and swung around behind the net before sending a perfect pass out into the slot. Ready and waiting was TOMAS ZABORSKY of Russian KHL club Avangard Omsk, the 26-year-old left wing who was chosen in the fifth round (# 137 overall) of the 2006 NHL Draft by the New York Rangers, who then shot past the German netminder Zepp first time to bring the Slovaks level at the 45:41 mark. The Slovaks were buzzing in the offensive zone again when disaster befell the Germans with a little over seven minutes to go in the Group H game in Helsinki. Zepp, the 31-year-old native Canadian who spent two seasons with Finnish elite league outfit Saipa Lappeenranta before transferring to Eisbaeren Berlin in the summer of 2007, sought to smother the puck but made a complete mess of his attempt. Although Germany center MARCEL GOC was in the immediate vicinity, the NHL-Crack with the Florida Panthers was caught very much by surprise and, thus, unable to lend any assistnace. Zaborsky, meanwhile, was more than happy to accept the gracious opportunity and merely backhanded underneath the unfortunate Zepp in order to notch his third goal for Slovakia at this year’s IIHF World Championships. Germany right wing JOHN TRIPP (21) of Koelner Haie, the 36-year-old National Hockey League veteran who has now appeared in more than 100 international matches for Deutschland in his long and well-traveled career, is thwarted by Slovakia netminder RASTISLAV STANA (31) of Russian club CSKA Moscow during the 2013 IIHF World Championships – Group H contest at the Hartwall Arena in Helsinki, Finland. Notes — Germany captain CHRISTIAN EHRHOFF totaled 29:20 of ice time while making his 80th career appearance in the national team uniform … Eisbaeren Berlin skipper ANDRE RANKEL, who was appearing in his 70th international contest on behalf of Deutschland, was the next most prominent player having skated one second more than twenty minutes for the Germans. 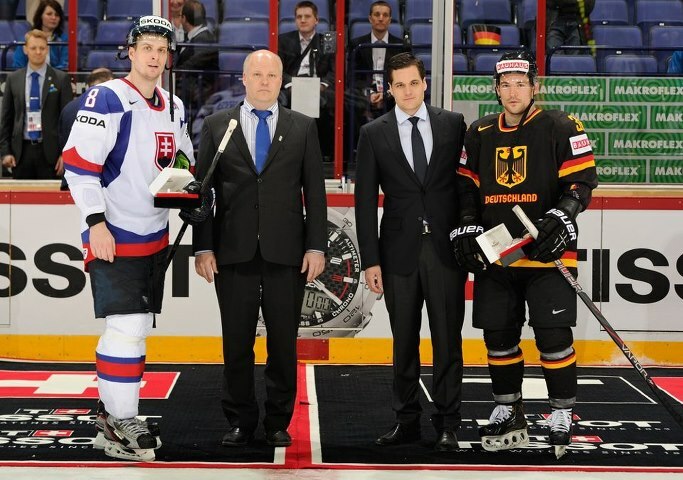 Adler Mannheim left wing YANNIC SEIDENBERG was chosen as Player of the Game for the Germans while defenseman MICHAEL SERSEN of HC Slovan Bratislava won similar honors for Slovakia. Slovakia defenseman LUBOMIR VISNOVSKY flips the puck past Slovenia goaltender ANDREJ HOCEVAR during the shootout round of the qualification round match between the two nations at the 2008 IIHF World Championships in Canada. Slovakia topped Slovenia 4-3 but failed to advance to the quarterfinal round. NOTE — Asterisk denotes player competed for national team of the former Czechoslovakia at major international event(s).